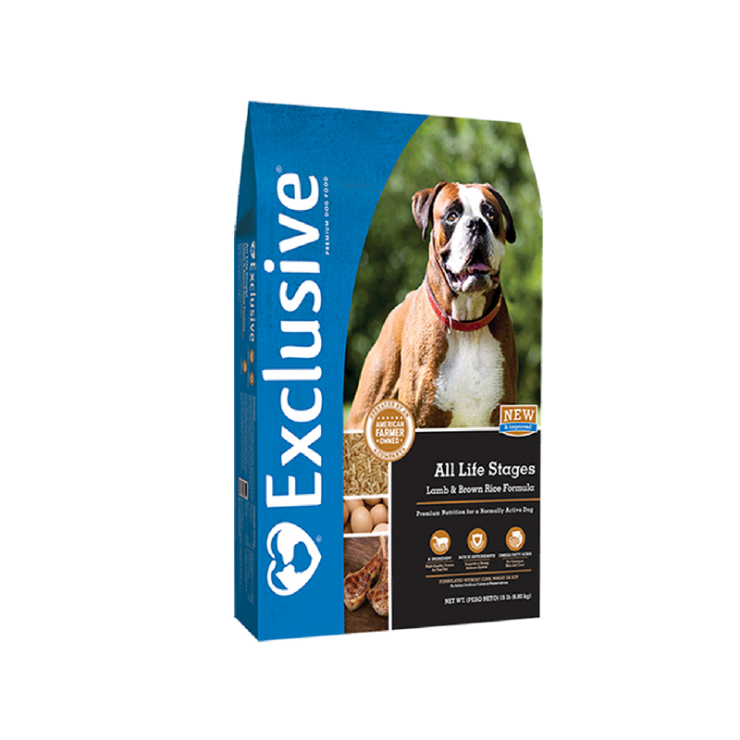 Exclusive All Life Stages Lamb & Rice Formula Dog Food starts with savory, natural lamb as its #1 ingredient. Lamb is an excellent unique source of high-quality protein for building strong muscles and lean, healthy bodies, is highly digestible for small stool volume and is rich in essential fatty acids for healthy skin & coat. Dish out a Gourmet Alternative. Savory, Natural Lamb is the #1 ingredient Nature’s best ingredients go into our Exclusive Lamb & Rice Formula Adult Dog Food, providing extra nutrients to help ensure your dog remains healthy for life. All Exclusive formulas are thoroughly researched and quality assured for balanced nutrition your pets will love. This specific formula is an alternative for dogs who need a protein-rich diet free from corn, wheat, soy, chicken, beef and pork. Our blend is inspired by the comforts of home: savory, natural lamb, hearty flavors and other wholesome, nutritious ingredients. And we guarantee that each ingredient serves an important purpose for your pet, so you’ll never find unnecessary fillers. It’s a promise you can see: healthy vitality, shiny coat, easy digestion with smaller stools and pure excitement as they dig into flavorful goodness at every meal. Exclusive® Lamb & Rice Adult Formula Dog Food is formulated to meet the nutritional levels established by the Association of American Feed Control Officials (AAFCO) Dog Food Nutrient Profiles for maintenance of adult dogs. The feeding directions are based on an eight-ounce measuring cup. One measuring cup contains approximately 3.3 ounces (94 grams) of Exclusive® Lamb & Rice Formula Adult Dog Food.